Over the span of this decade-long project, I’ve held 15 different jobs, not counting the odd jobs/side projects I’ve taken on to make a little extra money in lean times. Of those 15 jobs, more than half of them were found using the most infamous of search engines, Craigslist. There is a lot to be wary of when using CL for goods and/or services. When looking for places to live, you may discover that the pictures in the ad do not match the actual apartment. That “Used but like new” furniture may include an extra helping of bedbugs. Or the limo service you looked into but never signed a contract with might still arrive on your wedding night in a duct-taped POS and expect you to do business with them. Anything can happen. So, why, you might ask, would a person still do any business on Craigslist if there are so many scam artists, shysters and loons on the site? The simple reason is that, despite all the noise, if you know how to look, you can still find better deals and job opportunities on CL then on any other site, all without signing up for extra services or junk email. There might be better sites for 1 or 2 specific things, but there is no better place for doing everything. Now: I’m looking for work again. I’ve had a job for about a month and a half and I very much enjoy it. But I’m not getting enough hours, and New York City is way too expensive to try to get by on $300 a week. If I was still in New Orleans, I’d be set, but Brooklyn is decidedly not the Big Easy (though they share some of the same grooming habits). 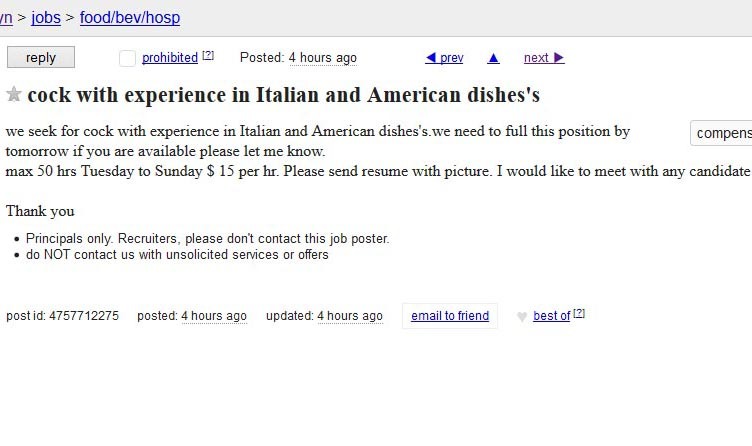 With as much restaurant experience as I have, I should be able to find work easily. I received job offers from both of the first 2 restaurants I interviewed at in Boston. I had a job in a week. It was actually kind of disappointing because I generally enjoy luxuriating in the unoccupied time off for a few weeks while I explore my new city. Alas, New York is a bit harder. Obviously. Why, you might ask? I can’t really say for sure. I’ve been into numerous bars and restaurants throughout the city, and none of them strike me as any busier, any wilder, any more Herculean places to work than those I’ve worked in the other major cities. I suppose it might be a way to keep out the country bumpkins who served 6 years in their papa’s Iowa truck stop diner. I’ve never even lived in Iowa. Put me in, coach! But I guess it really isn’t that bad. I do have restaurant experience and I’m getting called in for interviews (I have 1 today). It could be worse. I know everyone wants a hard worker, but that’s ridiculous. Also, I don’t think it’s acceptable to call a woman a “dish” anymore. Maybe I’m just old fashioned, but there are better places to post this kind of filth. Like Tinder. I still applied, though. I mean, I need a job dammit!